Since having struggled with acne in the last year, then it clearing up I have become obsessed with all things skincare related. I have been buying and trying out a variety of different products, from lots of different brands (Korean, American, French, English...). You name it I have probably looked into it, bought it or it's on my wish list. I've always been interested in beauty, but skincare hadn't always been a priority of mine and since having troubles with my skin I became a lot more attentive in what works for my skin, what doesn't, what's good for it and what is a lifesaver when you suddenly have a breakout. I have also loved looking more into the ingredients in skincare products and the ones I should avoid, the ones that are great and those that simply do nothing. 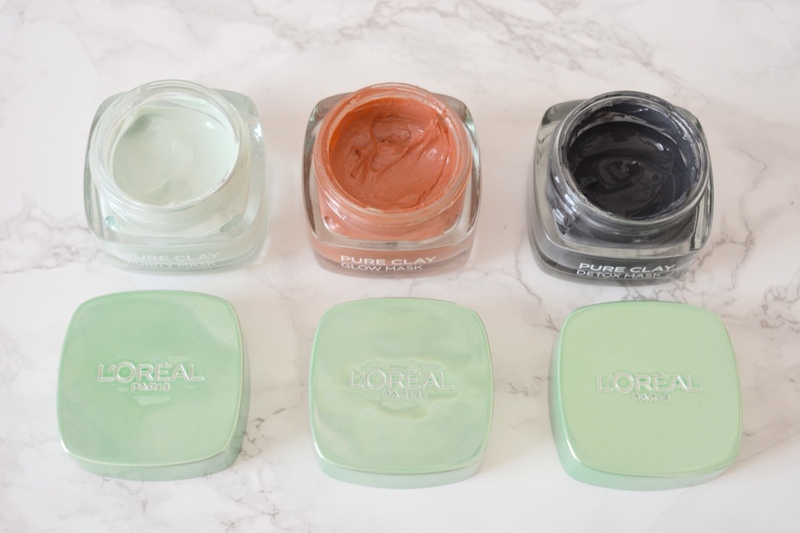 Whilst scrolling through Instagram a couple of months ago I saw that L'Oreal had released a range of Clay Masks, each designed to tackle a different skincare problem: to Detox, Purify or Brighten skin. After reading up a bit more about the range on a couple of blogs, I decided that I needed the masks in my life and had to see for myself if the product lived up to the hype. After loving the Detox Mask, I then bought the Purity one and then the Glow Mask, suddenly my collection was complete and I now have a face mask for my skins every need. Ever since reading about the benefits of charcoal being included in beauty products, I have been itching to get my hands on some skincare products with the ingredient in it. I first saw it in some Korean skincare products, then more frequently into some more UK high end products and ultimately into high street brands. 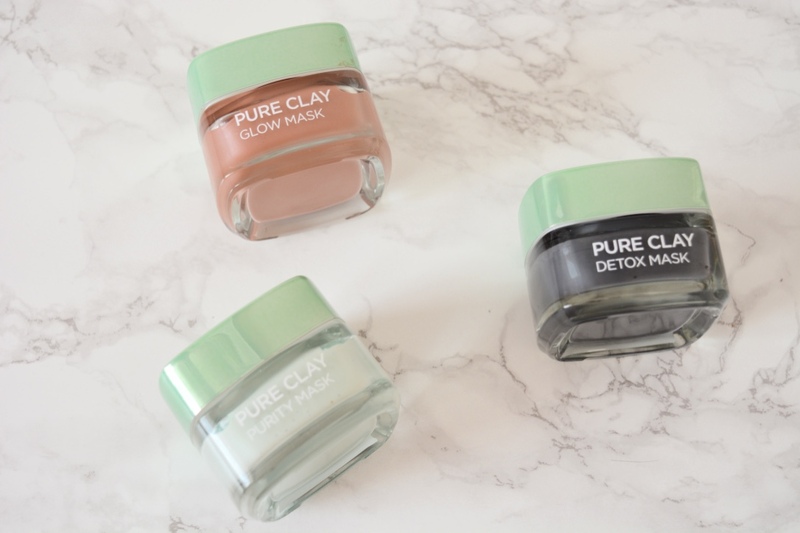 I first saw the L'Oreal Pure Clay Masks on Instagram and as soon as I saw one of them was a charcoal based mask, I was like 'gimme'. This is 100% my favourite out of the three clay masks and the benefits afterwards are amazing. The charcoal draws out all impurities and detoxes your face of any badness, leaving it feeling refreshed and smooth. It has a creamy texture to it and deeply cleanses your skin. I would have thought that having charcoal in beauty products would dry skin out but it had the completely opposite effect in the Detox Mask, it was hydrating and my face felt like it had a new life to it. I bought this little gem after falling in love with the Detox Mask (Charcoal based), I was intrigued to see if the Purity Mask (Eucalyptus based) was just as good and it is safe to say I wasn't disappointed. The Purity Mask contains eucalyptus extract, which is known for its purifying properties and leaves skin feeling renewed. I have to say I found all of the masks were great in helping with reducing the appearances of pores and leaving my skin looking flawless, the Purity Mask was definitely great at doing that. I also really liked the matte effect it has on skin and it smells divine, which is an added bonus. This was the least favourite of the three masks as I wasn't too fond of the beaded texture and it felt more like a scrub than a mask, but was still good nonetheless. My only criticism would be that when it came to taking the mask off, my face felt a little bit raw and red. It also didn't really dry as well as the other two, but it was a great exfoliator and I think I would use it for a shorter time when I next use it and would use less of the product. It's main ingredient is red algae extract, which is great for illuminating skin. My complexion felt brighter and it really did help exfoliate my skin, my pores certainly looked like they had a good scrub afterwards. All three of the masks cost £7.99 and they are currently on offer at Boots for £5, which I think is a bargain considering how much some masks cost and you get multiple uses out of these! On the box it says you get about 10 uses out of the bottle, but I definitely think you get more than that! The Detox Mask (charcoal) and Purity Mask (eucalyptus) are really thick, which means you don't need to apply as much, whereas with the Glow Mask less is definitely more. I also love all of the different scents the masks have and that they aren't bland in the slightest! My favourite scent out of the three has to be the Purity Mask (eucalyptus) as I love the herbal fragrance to it, my face feels instantly healthier because of it and I love the natural scent it leaves on my skin. 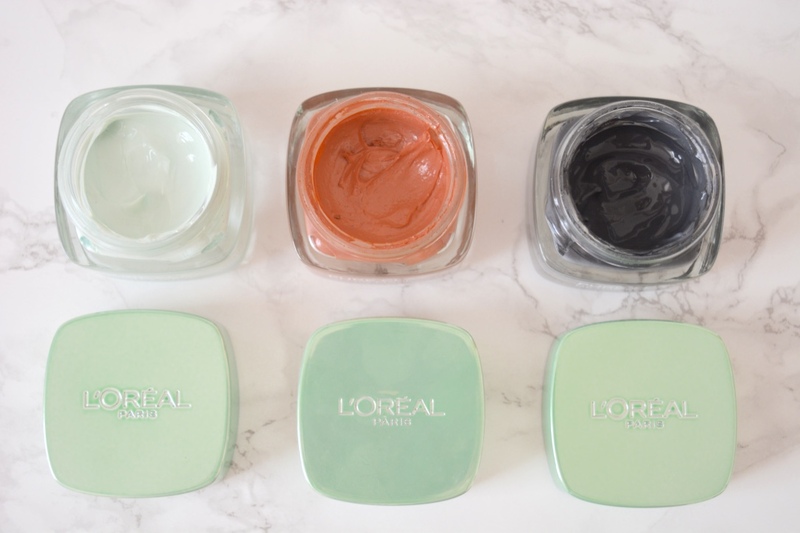 All of the masks are really hydrating, which you wouldn't necessarily expect and I have been really impressed with L'Oreal Paris' new releases! 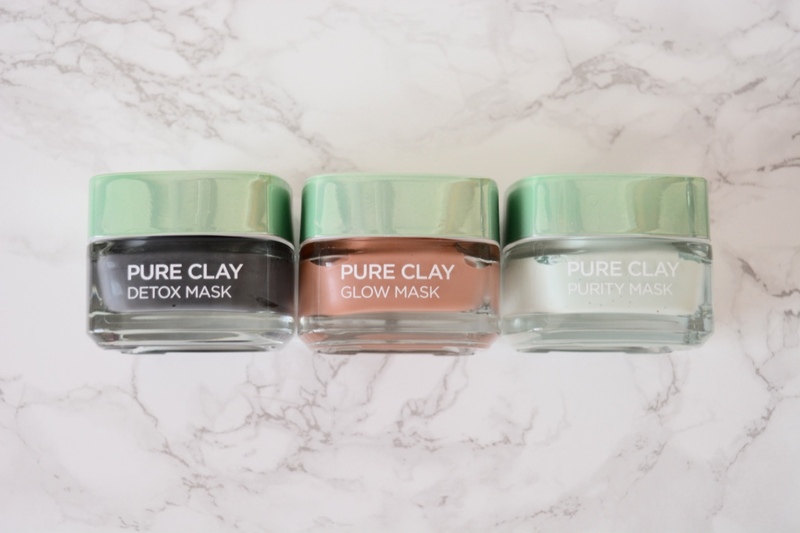 The three masks are also really great for multi-masking, which is wear you use a couple of different masks to tackle the different areas of your face based on the skin trouble in that area. For instance, using the Detox Mask (charcoal) on your T-zone, Purify Mask (eucalyptus) on your chin and Glow Mask (red algae) on your cheeks.